The interior boasts an extra layer of tin, which makes the pans resistant not only to corrosion but also fading. 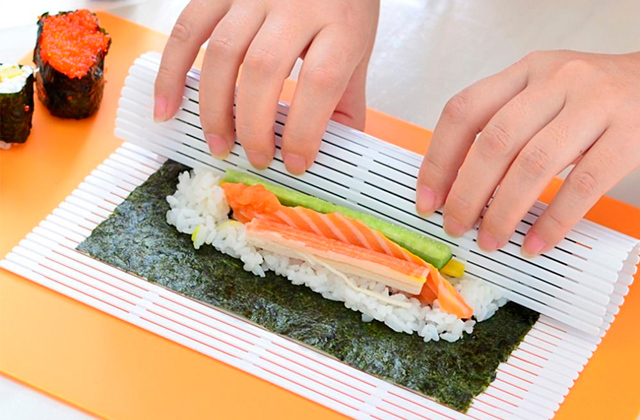 This design solution excludes the risk of appearance of any odd flavours and ensures that your food tastes lovely. Using pans with electric hobs is not recommended. 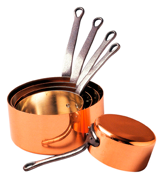 All pans from this set are made of copper (except for handles), providing it with twice better thermal conductivity compared to aluminium models. 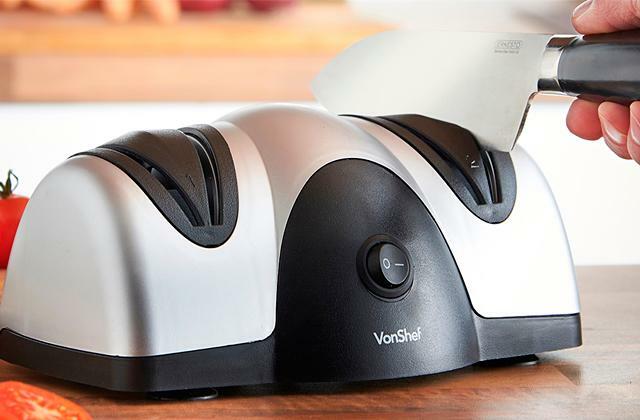 Thanks to this, your meals will be ready much faster too. The pans have rolled edges that allow you to easily pour the liquid right where you need it without spilling a drop. Handles have non-slip grips that let you firmly hold the pans even with wet hands. The pans are rather heavy. If you are looking for pans that won't allow your food to burn, make a choice in favour of this set. 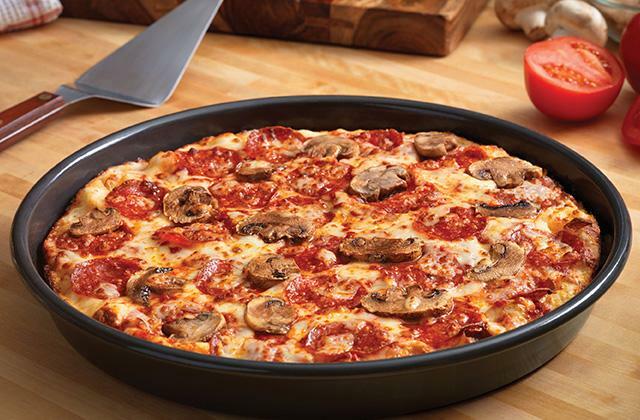 A 3-layer construction guarantees even heat distribution, and an inner Teflon coating allows for cooking with minimum oil. The bakelite handles won't get too hot even if the frying pan stays on the hob for a long time. So, you can safely hold it without oven gloves. And a hand sculpted wood-style makes them look very nice. They are oven-safe up to 150°C only. 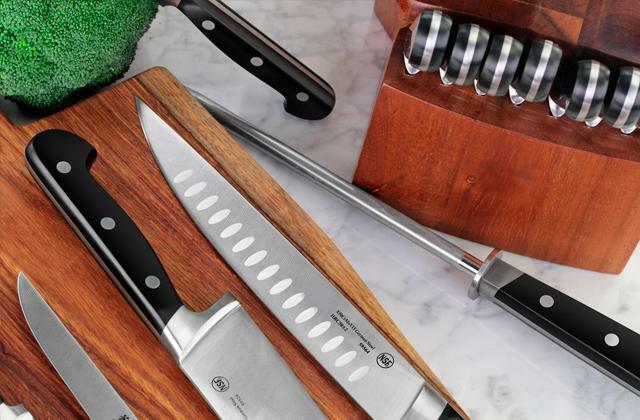 Made with the advanced copper-infused stone-effect inner coating, this set is perfect for frying food and preserve as many vitamins in food ingredients as possible. The set is dishwasher safe and won't lose its attractive appearance even after hundreds of washes, which makes its maintenance nothing but pleasure. The valves on the lid are a useful addition, designed to prevent "fogging" during use. The handles might get very hot. The Tower Set of 3 will come in handy for big families that cook a lot and cook regularly. With this set, you will spend your time wisely, making several meals at once, an opportunity that many people seek. The set includes a Fry basket, an irreplaceable tool for deep frying. 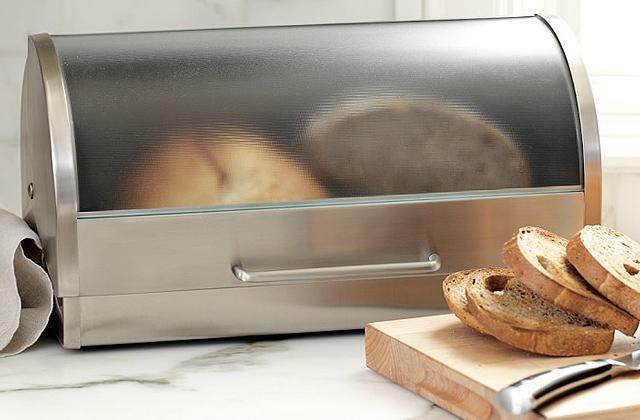 Also it has a steamer, so you can cook healthier meals and preserve more vitamins and nutrients. The non-stick coating doesn't last very long. This set has the biggest number of accessories on the list: it has 3 pans, 2 frying pans, 1 steamer, 1 tray and 2 lids. Thanks to this, you will not be limited in your options as to what to cook and how to cook. 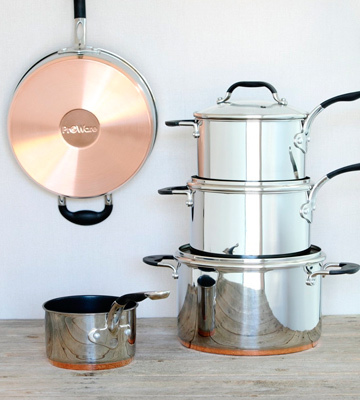 Baumalu is a famous cookware manufacturer that produces high-quality pans made of pure copper. The set we have here consists of 5 pans with cast iron handles. 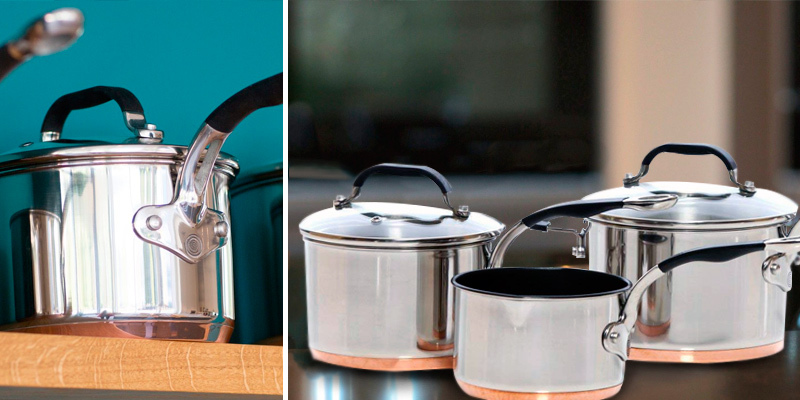 The handles have handy holes that allow users to hang pans on the wall for convenient storing. The kit includes 5 pans that are different in size, which enables you to cook several dishes at once. Their diameter varies from 12 to 20 cm. And since they don’t come with lids, you can stack them together if you want to save some space in your cupboard. 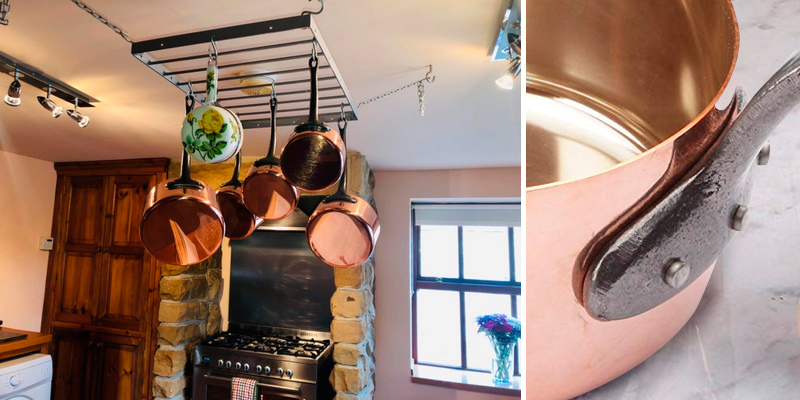 What we liked the most about these copper saucepans is that they boast great thermal conductivity. It is twice better compared to models made of aluminium. Thus, all your dishes will be cooked twice faster. The interior features the extra layer of tin which makes the pans resistant not only to corrosion but also to fading. This design prevents the appearance of odd flavours as well. Keep note that this set can be used only with gas hobs, which can be a problem if you have an electric stove at home. But if you don't, these are easily the best copper pans around that will let you cook delicious meals time after time in a fast and healthy way. 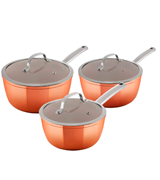 The ProWare is a set of 3 saucepans that are made of high-quality stainless steel and have a copper base with the inner Teflon coating. The 3-layer construction guarantees even heat distribution, while Teflon coating allows for cooking with the minimal use of oil. What is more, the pans have rolled edges that let users easily pour liquid from them without spilling even a drop. We also liked the design of the ergonomic, stainless steel handles. They have a soft grip section that ensures the pans won't slip out of your hands even if they are wet. Plus, they are completed with hanging holes for convenient storage. 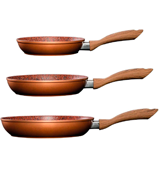 This set of non-stick copper pans includes 3 saucepans with a diameter of 14, 16, 18 cm and 2 lids (16, 18 cm) for larger items. All of them are made solid and high-quality. And rather heavy too, so be ready that you'll feel them in your hand. 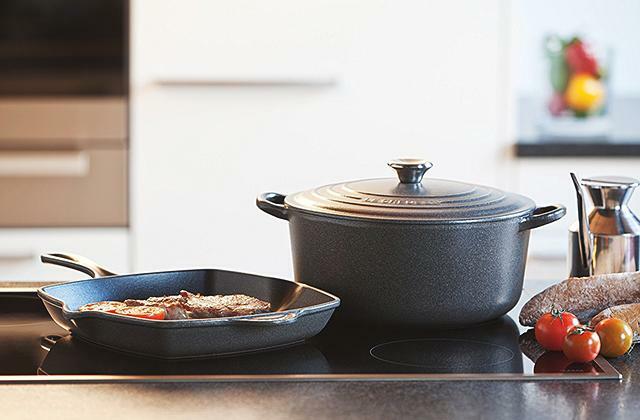 Though some say that they wish these pans were a bit lighter we like them as they are: unlike cheap cookware, they stand firmly on the hobs and do not tend to tip over. This isn't the only advantage of this set. Another great thing about it is that it can be used with all types of hobs (well, except only for induction tops). 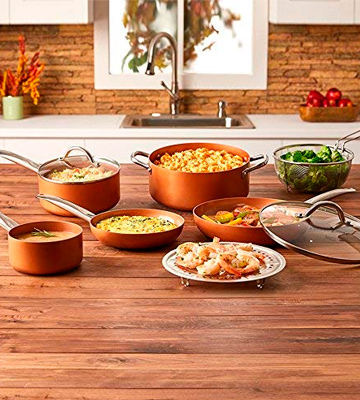 All in all, if you are looking for non-stick pans that will allow you to cook perfect meals, the ProWare Copper Base Cookware can be a worthy investment. Thanks to the stainless steel plate the cooking heat is evenly spread and the Teflon coating makes sure no food sticks to the surface. Plus, they are backed with a lifetime warranty, which says they are made to last. 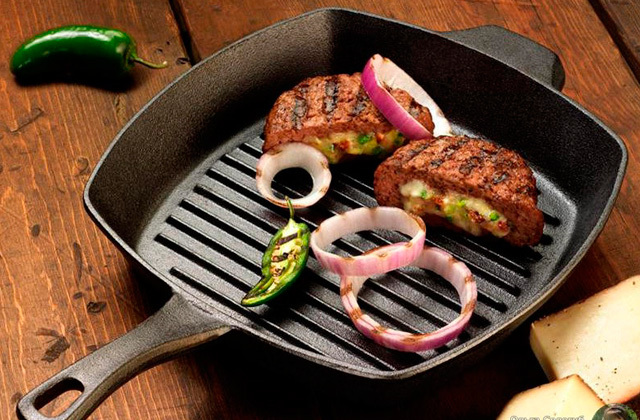 The JML set of copper-based frying pans not only looks good but it is also very convenient in use. 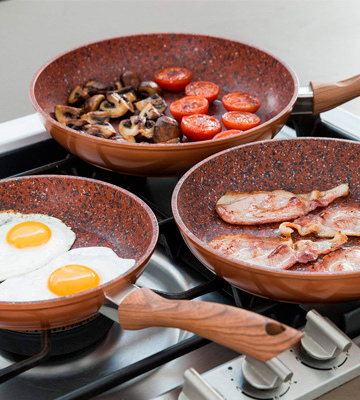 To begin with, these frying pans boast an advanced copper-infused stone-effect inner coating. 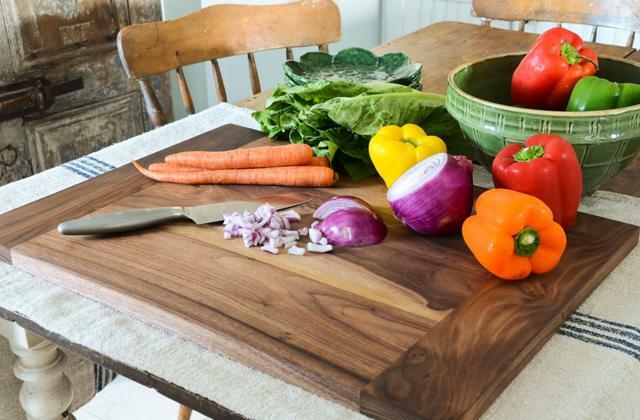 Thus, all the food you cook in it will save the maximum amount of vitamins and other useful nutrients. Speaking about the design of the pans, they have bakelite handles which won't get too hot even if the frying pans stay on the hob for a long time. You can safely hold them without oven gloves. And the hand sculpted wood-style design of the handles makes the overall look very nice. The next great thing about this set is that the pans are easy to maintain. 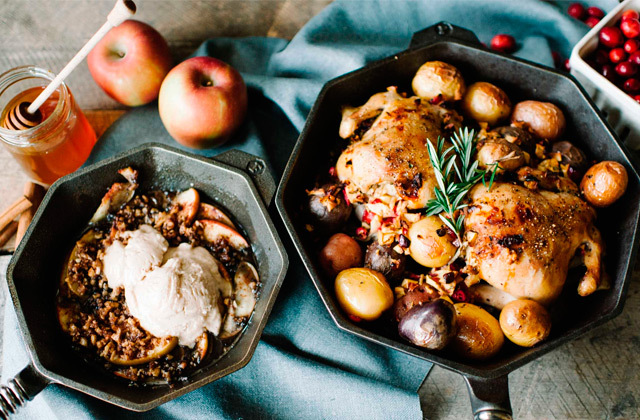 Not all copper pan sets are dishwasher-safe, but fortunately, this kit is. So, you can just put the pans into your dishwasher and relax. No more wasting your time on scrubbing. You can safely use the JML set with the electric, gas, and induction hobs as well as an oven. Yet, the manufacturer states that they are oven-safe up to 150°C only, so be very careful with the temperature you select in order not to damage the cookware. In conclusion, the copper-based frying pan set from JML will become a great addition to your kitchen thanks to the interesting design and good performance. 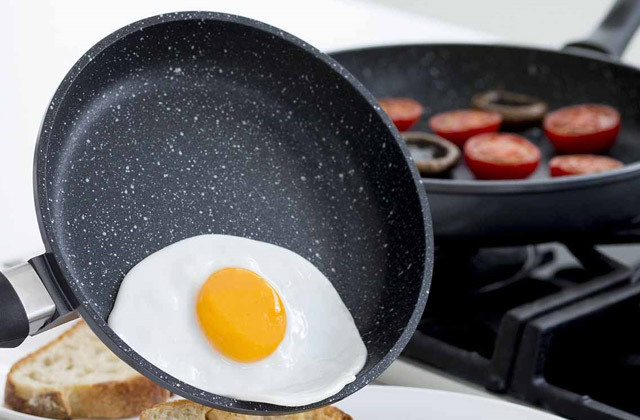 Three frying pans will allow you to cook with comfort, using any hob and even oven. With the Tower Set of 3 pans, you will be able to cook a wide range of meals. This stainless steel cookware with a copper finish can make the cooking process more efficient and versatile. 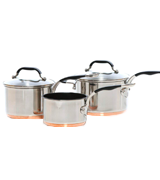 Since the pans come in small, medium, and large sizes, they will easily fit on any stove. Speaking of the latter, you can use them on gas and electric hobs, as well as induction tops. Positively, each copper saucepan comes with a glass lid. The valves on the lids allow the steam to come out and, thus, prevent the "fogging" effect. A lot of users seem to appreciate that the inner side of the pans has a ceramic coating that doesn’t allow food to stick. Hence, you can avoid using too much oil with these non-stick copper pans and cook low-fat meals. As a nice advantage, all the items from the set can be safely put into a dishwasher and you can be sure that they won't lose their appealing look and non-stick coating even if you wash them in it daily. 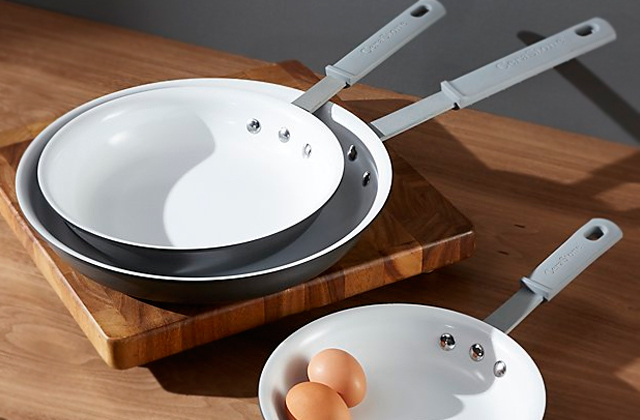 The only negative about these pans and the reason we've deducted a few points from this set is its handles. Not the handles in particular, of course, but rather the material they are made of. Made of stainless steel, they get pretty hot during use, so remember to wear oven gloves when moving or grabbing the pans. All in all, the Tower Set of Pans is great if you need cookware for cooking several /different meals at once. The saucepans have a solid construction. The maintenance is easy. And you can use them with all stoves, as well as in the oven. 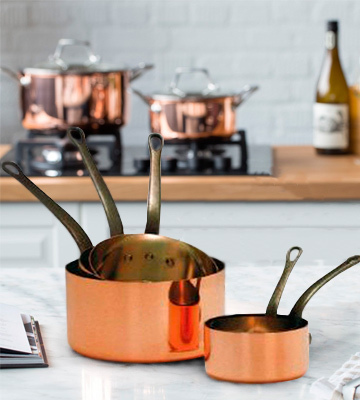 If you are looking for a generous set of copper pans that would come at a modest price, then the Copper Chef Set is what you need. 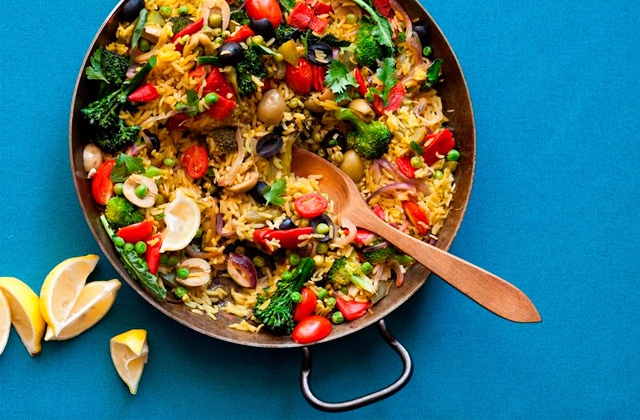 For less than 100 pounds, you can get a large kit that contains as many as 9 items: a casserole pan, 2 saucepans, 2 frying pans, 2 lids, a fry basket, and a steamer tray. 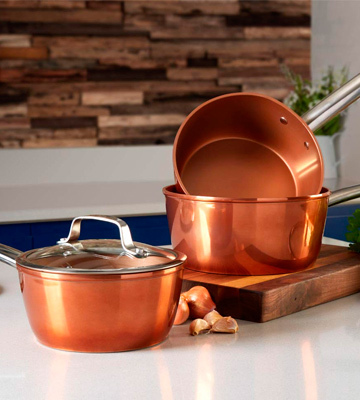 All the cookware in the set is made of a premium-quality copper. The saucepans, as well as frying pans, come in different sizes and have transparent scratch-resistant glass lids. With such a large set, you will be able to fry, sauté, braise, brown, and simmer. The additional Fry basket will be very useful for deep frying, while the steamer will help you cook steamed dishes and preserve vitamin content in foods. 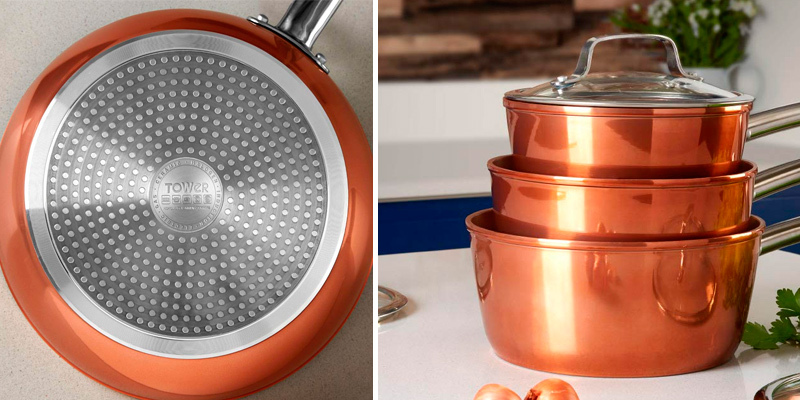 Like some counterparts, these copper pans are dishwasher-safe and have a non-stick coating. Unfortunately, a lot of users point out that the coating doesn’t last for a long time if heavily used, so try to maintain the pans carefully to prolong their lifespan. Still, we believe that the Chef utensils are the best copper pans you can find for the money. Whether you love cooking and usually cook a lot of meals or you need a single set to cater to all your needs, this kit will fit you perfectly. 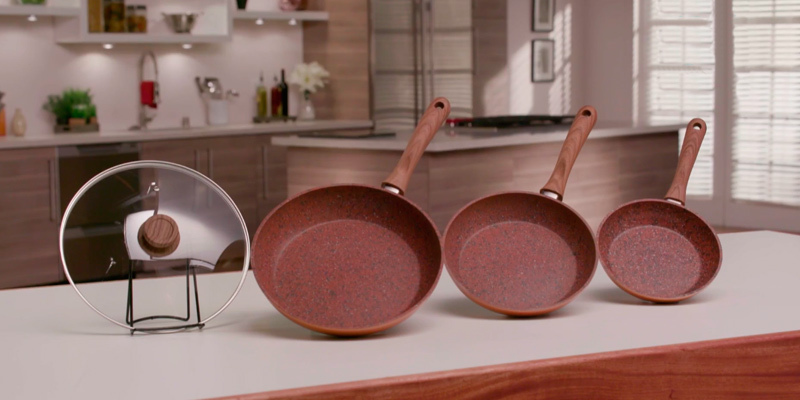 What Is a Copper Pan Set? Nowadays more and more copper sets appear on the market because they really have a lot of advantages. 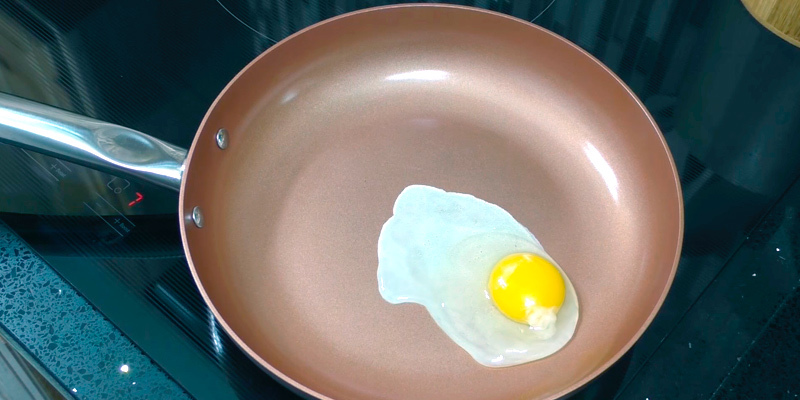 First of all, copper pans boast impressive heat conductivity. As a result, the whole surface heats up evenly, without any hot or cold spots. Hence, there is no risk of undercooking or overcooking a dish. That's why a lot of professional chefs prefer copper cookware to the stainless steel utensils. Most copper pans come with a non-stick coating that minimises the use of oil. We can also add that a lot of (but not all) copper pans are suitable for both gas and electric hobs, as well as ovens. Lastly, this unique cookware can add new colours to any kitchen and spice up the interior a little bit. You can find numerous kinds of copper cookware including frying pans, saucepans, and casserole pans. 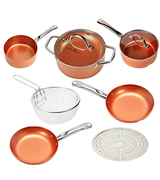 To help you with your choice, we have selected the best copper pan sets that may become a great help in your kitchen. And for the most dedicated chefs, we also have a selection of pizza pans and griddle pans.